Trophy abalone diving is northern California’s own unique extreme water sport especially along the Sonoma, Mendocino, and of course, Sea Ranch coasts. This is the area we affectionately call Mendonoma. With the purple urchin laying the ocean floor baren, sea stars “wasting away” with the disease, and the demise of the kelp forests after rising water temperatures in the Pacific Ocean all Abalone Harvesting is canceled through April 1, 2021. At that time the regulations and the health of the ocean’s inhabitants will be reaccessed. Every diver dreams of getting the big one when sport diving for the red abalone (Haliotis rufescens), or “ab” as they are affectionately called. They are found on rocky intertidal and subtidal areas and cling to rocks along the shore down to depths of 65 meters. If you’re only allowed 9 abalones a year… make them 10 inchers! In fact, it was the 10-inch abalone that Jorge, my husband found while trophy abalone diving the morning we decided to purchase our Sea Ranch home that inspired us to call our vacation rental, Abalone Bay! With the bluff access right outside our back door and a nearby staircase at Smugglers Cove leading them to the water’s edge how could divers of all ages and skill levels not want to try their skills at nabbing a big one! Before you go diving for abalone of any size it is imperative you are familiar with the current regulations. The red abalone species is the most common as well as the largest of the seven native California abalone species. Given California Fish and Game’s restrictions that limit the total number of abalone harvested in not only a day’s dive, but also within the year’s time, many divers are opting to be more judicious in their selection of abalone that will dress their dinner plates. Yes, more and more divers are challenging themselves to hold out for the big one~an abalone of at least 10 inches or more! All abalone diving trophy abalone diving is put on hold through April 1, 2021. Three abalone, with a maximum of 18 abalone per year. Only 9 abalone total may be taken south of Mendocino County per year (includes Marin/Sonoma County-Sea Ranch; Annual Limit: 9 abalone). Red abalone may only be taken from 8:00 a.m. until one half-hour after sunset. The minimum size limit is 7 inches along the longest shell diameter. Abalone report cards are required for everyone (regardless of age) taking or attempting to take abalone. Abalone tags are required on all abalone. Sea Ranch continues to be a steward of not only the land but also the creatures in the community, whether on land, in the air, under the sea. To that end, the HOA has strict regulations to protect the habitat and numbers of the Sea Ranch Abalone. Be absolutely certain you have your California sports and fishing tags on your person and that you follow all current regulations. EQUALLY IMPORTANT – KNOW where the marine sanctuaries are located. Use our trail maps to point them out. DO NOT dive, fish, or otherwise disturb the wildlife in any marine reserve or habitat sanctuary. Only the person(s) on Abalone Bay’s booking contract and no more than four (4) other guests may dive. You may access the ocean bluff trail by crossing through our property only. Please stay on our path to the bluff trail. Do Not cut across our neighbor’s property. Use the hoses to rinse off your dive gear and yourself. DO NOT USE THE HOT TUB TO RINSE EQUIPMENT OR YOURSELF- it was not meant for that! But by all means, enjoy it afterward. Trophy “abs,” as locals call the coveted mollusks, are abalones that have grown to 10 inches or greater. Early Research indicated abalone grow approximately one-half inch per year. Thus, a two-year-old abalone would be 1.6 inches long, a three-year-old, 2.15 inches, and a red abalone 8 inches in diameter, would be 13 years old. The 8-inch ab may have 25 years or more to live. Most are between 7 and 9 inches. However, later research indicates that growth is not always consistent and may vary depending upon water and food conditions. A 10-inch abalone is probably 25-30 years old and in most cases is at the end of its life cycle. But that being said, because red abalones which attain lengths exceeding 11 inches are usually crowded, snuggly fitted in between rocks, and obscure, it has not been possible to distinguish a true annual growth ring if such exists. Trophy abs are harvested by free diving as deep as 30- 65 feet below the surface in the 50ºF Pacific waters along the shoreline. Abalone divers must dive down into the murky waters, locate their prey, position their abalone all on one deep natural breath. But some have also been discovered in shallow areas that have not been “picked over” or bothered by hunters. Equipment Needed for Trophy Abalone Diving. Diver’s float line (float lines are sold in different lengths. They should be brightly colored to be easy to locate if the diver loses sight of the line. Ten inch gauge or larger depending on your goals. This is a must when underwater most 9 ¾ inch abalone look bigger and meatier than the tens next to them. The Trophy Diver’s motto is measure once measure twice measure three times and if it hits on the gauge all 3 times then pop it off. Note even though you may only be seeking 10 inch abalone the CA DFW abalone regulations state the following “Every diver shall carry a fixed caliper measuring gauge capable of accurately measuring seven inches. The measuring device shall have fixed opposing arms of sufficient length to measure the abalone by placing the gauge over the shell” (California Code of Regulations Title 14, section 29.15(f)). All divers must carry an abalone gauge that measures seven inches and any abalone removed from the rock that measures seven inches or more must be retained (CCR Title 14, section 29.15(d)). Wildlife officers frequently find people trophy hunting with only nine or 10 inch gauges in their possession and they end up citing many of these individuals for high grading because they are detaching and replacing abalone that are less than nine or 10 inches, but are otherwise legal to take. A good bright Flashlight, A flashlight is a must to be able to look into the dark deep holes. Keep in mind like stated earlier it can take up to 25 years for an ab to reach ten inches so to find them you have to look in spots where no has for that amount of time. Most divers do not dive with a light so those abalones that have sat in darkness have been there a long time and have grown big. (Small flashlights are much easier to handle than large lights) The more lumens and brighter are the better. Trophy abalone diving requires the diver to be not only in good physical condition but also especially vigilant as he or she searches among the cracks and crevices for their hidden treasure. Unlike the warm, crystalline waters of the Caribbean, the waters north of San Francisco have very poor visibility and are often very turbid. A great diving day may be underwater vistas of as much as 10 feet. Other days you’re lucky if you can even see your hand in front of your face. Abalone make their home clinging onto the Pacific shoreline rocks north of San Francisco. Trophy abalone diving requires divers to withstand the chill of the water, the change of tides and the frequent pounding of the surf as it slams them up against the rocks while they poke about the craggy inter-tidal coastal areas. Each opener of abalone season is followed by tales of tragedy of inexperienced divers or weekend warriors attempting to out smart the stationary shelled creatures and the elements below the water’s surface. Trophy abalone diving also requires a bit of mountain goat-like climbing skills as well! This is especially true if diving along the south of Sea Ranch between Salt Point and Fort Ross. The rocky cliffs are composed of loose shale and sand. One miss step may be the end of a great day before it even started. Getting down may have been easy. Getting back up with a load of abs and fish may be another story! We continually are amazed by the abalone we are able to find at Sea Ranch. What has amazed us is with each dive the guys never fail to pull out at least one legal 7 inch abalone and often larger. As for the 10 inch abalone that Jorge found he has it polished and propped at his desk. But for those of you who are able to relinquish your prize and want the public bragging rights Jay Baker’s Hardware in Gualala proudly displays the shells of many trophy abs found along the Mendonoma coastline. Jean Jackson’s Mendonoma Sightings frequently includes photos of Eric’s latest trophy. Check them out here. Eric also has a great video on how to dive for abalone, why he enjoys this extreme sport, its dangers and the humpback whale he bumped into. Looking about I discovered that while Jorge’s ab was pretty close, it had not reached record breaking size. That honor belongs to John Pepper who in 1993 found this 12 5/6″ abalone shown below. The next honor belongs to Matt Lum of Santa Barbara who in 2005 popped off the heaviest animal to date. While not as large as Pepper’s, it exceeded the weight of the second largest known animal by over 20 percent! The huge shell size of almost 11 inches in length, combined with a disproportionate width of about 9.5 inches plus extreme depth, caused the effect of being somewhat like a giant, almost circular, deep salad bowl. More photos on the trophy abalone diving wall of fame as found in: The Hunt for Monster Red Abalone (Divers and abalone enthusiasts may find Dr. Abalone’s other blog posts of great interest). And last but not least is Randy Jones pictured below. 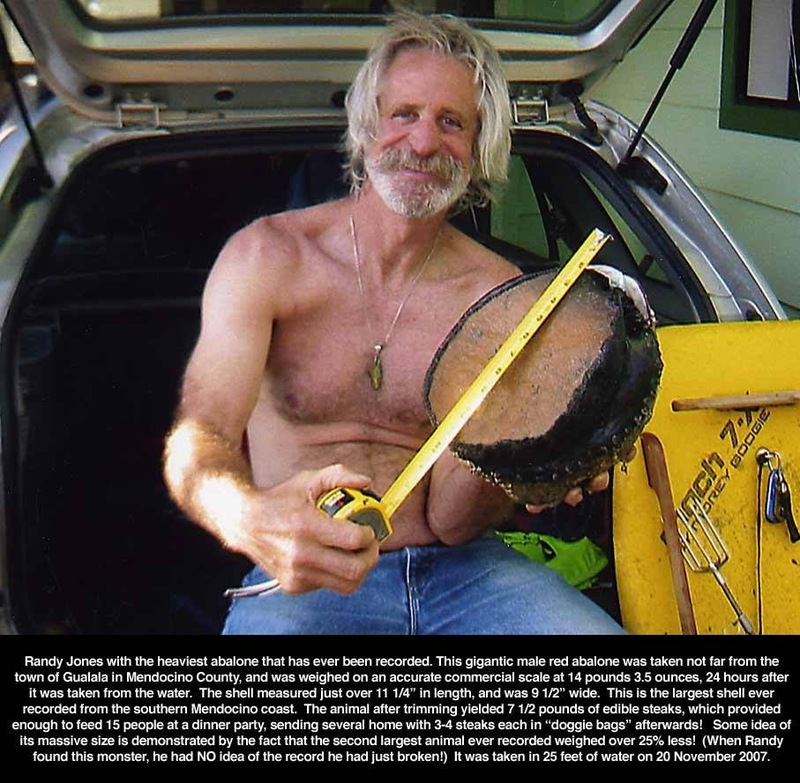 Trophy abalone diving is not the only thing that Randy Jones does! He also is a ceramics artist too! Know as Abalone Jones he is of course he is known for his abalone art pieces. So now you found it…. what to do with it? Once you bring your abalone back to Abalone Bay you’ll find our fish cleaning station very useful. Fish cleaning station- note the abalone sporting the California Fish and Game tags. View this youtube video to get a good idea of what it takes really takes go trophy abalone diving. It also shows how to prepare it once you get home. However, nothing tops the way our friend, Doug, prepares it – whole and deep fried. Easier still – just give Monterey Abalone Company a call and have them over night ship your abalone directly to you while staying Abalone Bay. Visit their website for delicious recipes as well. Share Your Trophy Stories With Us! Have you seen any big ones too? We’d love to see your diving trophy photos…. Or any success story you wish to share. And don’t forget to share your favorite recipe! 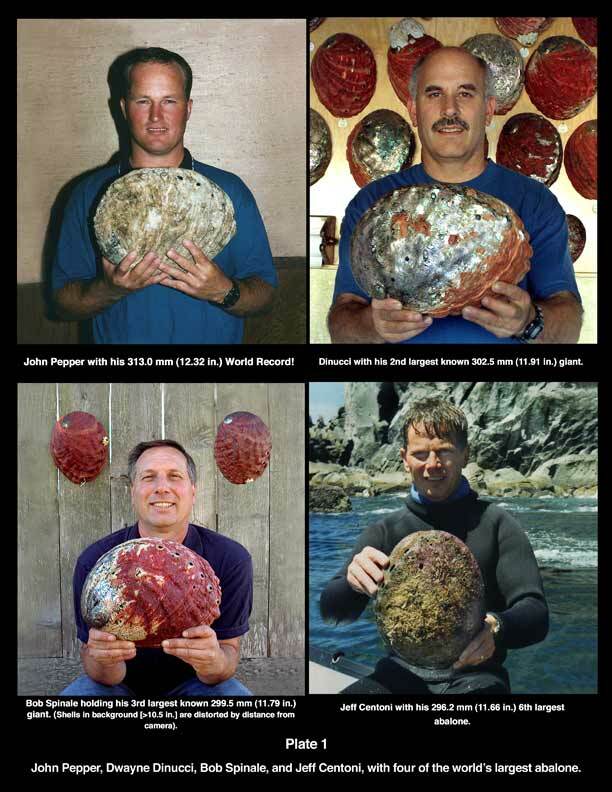 Note: This article was first Publish on: Jan 8, 2014 and titled: Diver Dreams – 10″ Abalone at Abalone Bay ! This post will be periodically updated to assure information remains correct. For more information about California’s abalone, visit the Invertebrate Management Project Web page. For complete abalone fishing regulation information, refer to the current Ocean Sport Fishing Regulations booklet.